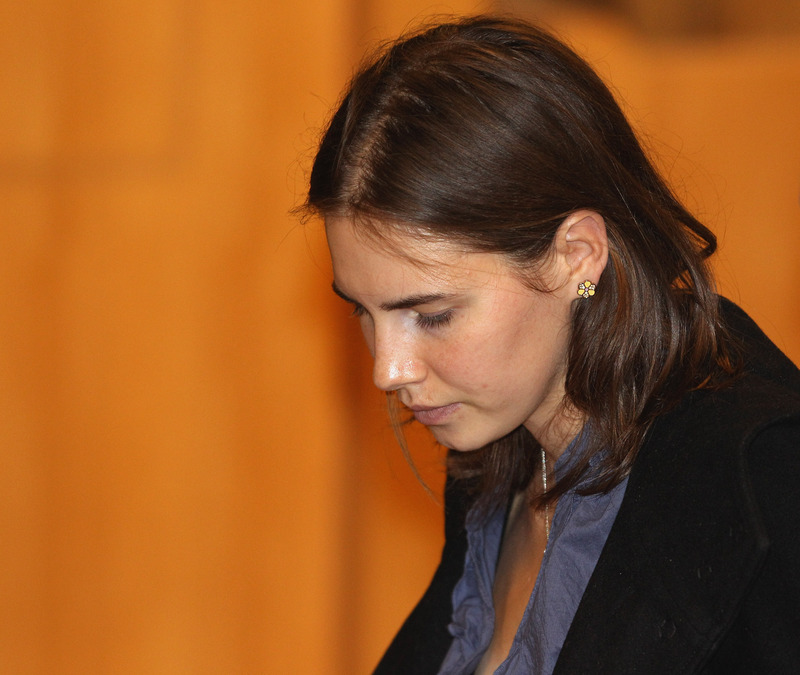 The trial (or trials) of Amanda Knox were full of ups and downs. The American studying in Italy was first arrested for the murder of her roommate, Meredith Kercher, in 2007 when Knox was just 20 years old, and was convicted of the crime two years later. Nearly two years after that, Knox's appeal was upheld and she was set free — only to be retried and found guilty again a little over a year later. Finally, in March of 2015, a second appeal found Knox innocent, for good this time. But even after all that, one big detail about the case remained a mystery: the fact that, early on in the investigation, Knox accused a man, Patrick Lumumba, of being involved in Kercher's murder, causing Lumumba to be briefly arrested. So why did Amanda Knox accuse Patrick Lumumba of killing Kercher? During the first few days of the investigation, Knox was heavily interrogated by police about her possible involvement in Kercher's death. After initially maintaining that she had spent the night of the murder at the home of her boyfriend, Raffaele Sollecito, Knox changed her story during questioning. She claimed that she was actually at her apartment, and was in the kitchen when she heard Kercher's screams as she was being murdered. The killer? Knox claimed that it was her boss, bar owner Patrick Lumumba. Lumumba was arrested, but was released two weeks later after proving that he had an alibi: that he didn't leave his bar on the night in question. Knox recanted her story within hours of telling it, but by then the damage was done, and Lumumba spent unnecessary time in jail. So why did Knox lie, and why did she choose this particular story? According to Knox, as detailed in the new Netflix documentary Amanda Knox , she became confused during the interrogation. She was originally scheduled to work the night of Kercher's murder, but Lumumba had texted her and told her not to come in. She replied something to the effect of "See you later, have a good night!" in Italian — a language which she spoke, but not fluently. She alleges that the police, using her phone as evidence, told her that her text actually meant that she would see Lumumba later, meaning that they planned to meet up later that night. She claims they convinced her that she was either hiding something or had repressed a memory, and that's when she says she had flashes of her apartment, hearing Kercher's screams, and seeing Lumumba in a brown jacket. She allegedly put these flashes together into a story that she then told police, apparently believing at the time that it was the truth. Contributing to her alleged confusion was the intense nature of the interrogation. Knox claims that she didn't understand much of what was going on due to the language differences, and she claims threats were made against her by the police. She also alleges that an officer slapped her on the head repeatedly whenever she gave an answer he didn't like. In a statement she wrote to police recanting her confession, Knox wrote that she's "very doubtful" of the verity of her statements "because they were made under the pressures of stress, shock, and extreme exhaustion." Because of that pressure, she wrote, she came up with images of Lumumba at the scene of the murder, but now, those things felt "unreal" to her, and she was "unsure if they are real things that happened" or just things she made up to cope with the questioning. Later on in her statement, Knox wrote, "I stand by my statements that I made last night about events that could have taken place in my home with Patrick, but I want to make very clear that these events seem more unreal to me that what I said before, that I stayed at Raffaele's house ... In these flashbacks that I'm having, I see Patrick as the murderer, but the way the truth feels in my mind, there is no way for me to have known because I don't remember FOR SURE if I was at my house that night." After being told repeatedly that her true memory was false, and being punished for believing it, Knox might've begun to doubt herself. Her brain could've then concocted a false scenario based on what she thought her interrogators wanted to hear, and she may have briefly believed this false memory to be fact. This is what's known as a false confession, and according to the Innocence Project, 1 in 4 people who are falsely convicted of a crime and exonerated by DNA evidence make false confessions — so they're more common than you think. Ultimately, Knox sums up the reasons for her false confession on her website thusly: "Coercive interrogation techniques that produce false confession, including: prolonged, overnight questioning, intimidation, repetition, suggestion, violence." According to SeattlePI, many police witnesses have denied Knox's claims about the tactics used, saying instead that she was treated well during that time. Yet the techniques allegedly used by her interrogators, Knox claims, are the reasons why she accused Lumumba of killing Kercher.